Digital hydrographic printing is here. It is no longer a theory. 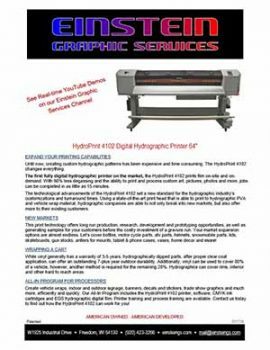 You can now print digitally to a proprietary PVA film using Einstein Graphic Service’s digital hydrographic printer and ink. The HydroPrint 4102 changes everything. The first fully digital hydrographic printer on the market, the HydroPrint 4102 prints film on-site and on-demand. With 98% less degassing and the ability to print and process custom art, pictures, photos and more, jobs can be completed in as little as 15 minutes. This print technology offers long run production, research, development and prototyping opportunities, as well as generating samples for your customers before the costly investment of a gravure run. Your market expansion options are almost endless. Let’s cover bottles, motor cycle parts, ATV parts, helmets, snowmobile parts, lids, skateboards, gun stocks, antlers for mounts, tablet & phone cases, vases, home decor and more!